Hogwarts Houses. I'm in Gryffindor.. Wallpaper and background images in the Harry Potter vs Chạng vạng club tagged: harry potter jk rowling funny houses gryffindor hufflepuff ravenclaw slytherin. I was about to rant on this about dissing Hufflepuff, but it disses everyone. That makes me happy. i agree with harrypotterbest !! But best, I'm the most important Puff! Who cares if they're dead? Everyone dies, doesn't take away from their awesomeness. Bellatrix forever! Slytherin FTW. Hufflepuffs are fails. Other than Tonks, she was pretty cool. ^ Hufflepuffs are not fails. I'm not a Hufflepuff, it's my 3rd fav house, but Tonks is my 3rd fav female, and she's a METAMORPHMAGUS! (sp?) beat that! I'm a Gryffindor! And why on Earth would I let anyone else win the Cup? It's Gryffindor tradition to win the Cup! Only when the trio is in Hogwarts, before that they hadn't won the cup in years ;) Seems like there a more Hufflepuffs here. We win. Tonks is cool, but Hufflepuff takes all "the rest" that the other houses won't accept. How do you know other houses won't accept them? Cedric and Tonks were really brave, they could have been in Gryffindor. And Hufflepuff isn't just the rest. If Hufflepuff is the rest, the the rest are Hogwarts champions and Metamorphagi. How badass is that? HP doesn't even have any cool real powers of his own, he got Parseltoungue from Voldy and he was only a champion from BCJ putting his name in the Goblet. Hufflepuffs RULE! Harry is awesome! He can LOVE!!! And remember, Harry is the one who helped out Cedric with the dragon hint and with the underwater rescue. Plus, Harry saved Cedric from the maze a couple of times. Hermione is super-smart! She saved the world so many times!!! Without her, the Wizarding World would be dead. She saved Harry so many times; figured out the Basilisk mystery, the time turner problem, started the DA, SPEW, and so many other things. Ron is hilarious. He saved Harry as well, he was 'most important' to Harry, he makes everyone laugh, and so on. Those aren't powers. Harry can't turn his hair pink. Hehe. & WE have the most important person of all... Ready for it?... (boo you know because you told me lol) JKR is a Hufflepuff! WOOO. She is more important than anyone, BEAT THAT. Actually LifesGood, on JK Rowling's official website, it says she is a Gryffindor. Well people are giving me different information. No, I read that she was a Hufflepuff. And see (if you are right, best), there you go, exactly why the whole book is biased on Gryffindor. Im in between Ravenclaw and SLytherin. Oh, Oh! 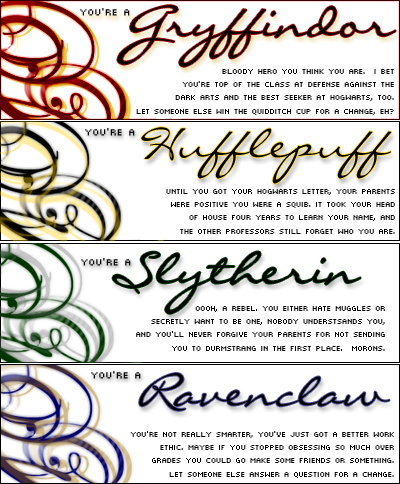 I'm a Raventherin or, or a Slytherclaw!!! Oh, and Boo, the whole book has to be based on something, right? All the quizzes put me in Grffindor, while I think I'm a Slytherin. Thats offending and really mean to HufflePuffs :( Especially ME! I'm a Gryffindor... But I love some of the Slytherin people like Voldemort, Bellatrix, Snape, Lucius, Draco and Marcus Flint! At least Slytherin likes being hated. They`re the internet trolls of Hogwarts, they are.